Our electric go kart plans are free to download and have all the details you need to make a kart with great performance. We offer the added bonus of on-line support for our customers who 'buy us a coffee' at the check-out. We've included lots of useful resource links and you'll find lots kart photos on this site. If you want to design your own kart but need some inspiration, our free plans pack will give you a head start and a ready source of ideas. We're here to help - please email us at contact@hwm-designs.com with any questions. Visit our 3D plans page for more information about a great addition to our free plans pack. We've developed a fully interactive 3D PDF model that can be viewed in Adobe Reader (10 or higher). 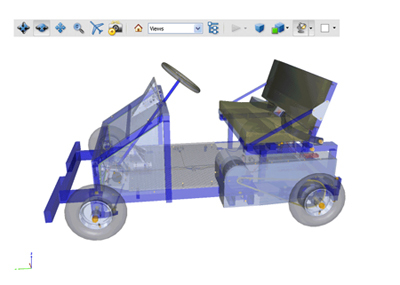 3D PDF allows you to turn, tumble and zoom an image of the complete electric go kart. This is a fantastic aid for building the kart and complements our popular free plans pack. If you are looking for a'garage engineering' project that can be built with basic tools then look no further. Fitted with a 500W motor this electric kart is capable of 12-15mph (but can be restricted to lower speeds). The design is flexible and can easily be adapted. As drawn, the kart is 1.32m long, has track (width) of 0.99m and stands 0.62m high. Made with a steel tube section frame,the kart is a simple welding project with a TIG, MIG or MMA (stick) welder. The design is scalable and all dimensions can be multiplied by up to 20% to produce a larger kart. The project is a great way to learn about welding, electric drives, speed controllers, steering geometry, braking systems and mechnical engineering. A lighting system is fitted, making night-driving possible. Speed is controlled by a 4QD motor controller that also produces a regenerative braking effect. Additional braking for the kart is provided by a cable operated disc brake. We have lots more exciting builds at our main site. We love to up-cycle and re-cycle and have some easy to make projects for your workshop, including storage for air tools and air hoses, a bench drawer, workshop clock and storage shelf. Make sure you visit today.